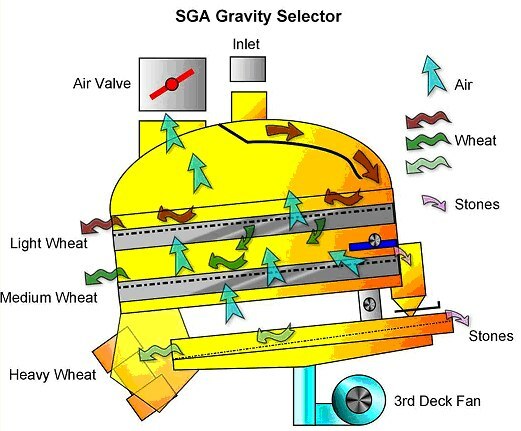 The Satake SGA Gravity Selector is used for the separation of light and heavy materials from grain. The machine sorts the grain in to heavy and light fractions as well as providing a very efficient stone separation. The machine can also be used for separation of other products such as wheat flakes, peanuts and in the seed cleaning industry. The Satake Gravity Selector can be used to concentrate impurities for more efficient separation by subsequent machines such as cylinders and discs. The discharged stone from primary sieves contains some grain. This mixed fraction is sent to the secondary sieve using blowing air from a built-in fan where stones are concentrated and discharged. This allows a more efficient stone/grain separation to be made.